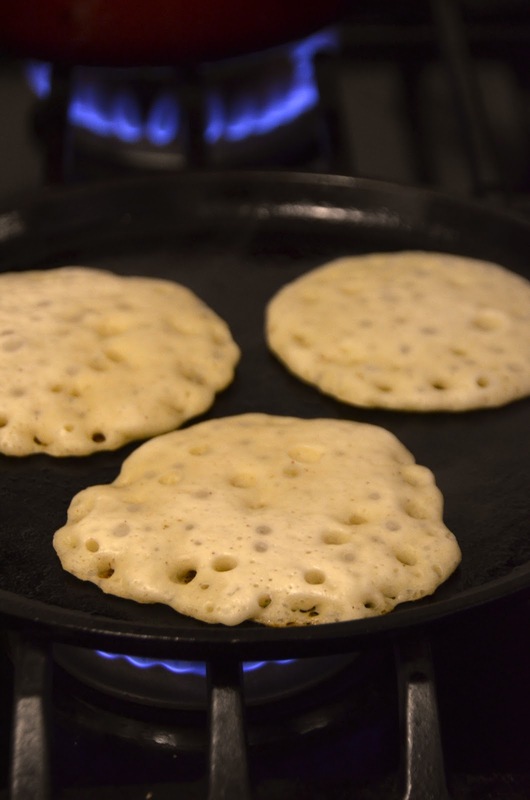 Cooking them on only one side makes for a bubbly crumpet or English muffin-like top that is perfect for absorbing butter, syrup, or any other toppings. In Morocco, baghrir are typically made into large, thin crepes and served either with butter and honey, or rolled around sweet or savory toppings. I like to make my baghrir a bit smaller, and serve them as a stack topped with butter and a sweet orange blossom-scented honey syrup. A handful of fresh berries adds a little extra color and natural sweetness! Moroccan baghrir batter is made with a mix of both yeast (you can use instant dry yeast) and baking powder, which helps create all the wonderful nooks and crannies. Another cool thing about this recipe is that it is vegan--no eggs, milk or butter in the recipe at all! The honey and butter on top isn't vegan, but you can easily swap in your own favorite toppings as desired. 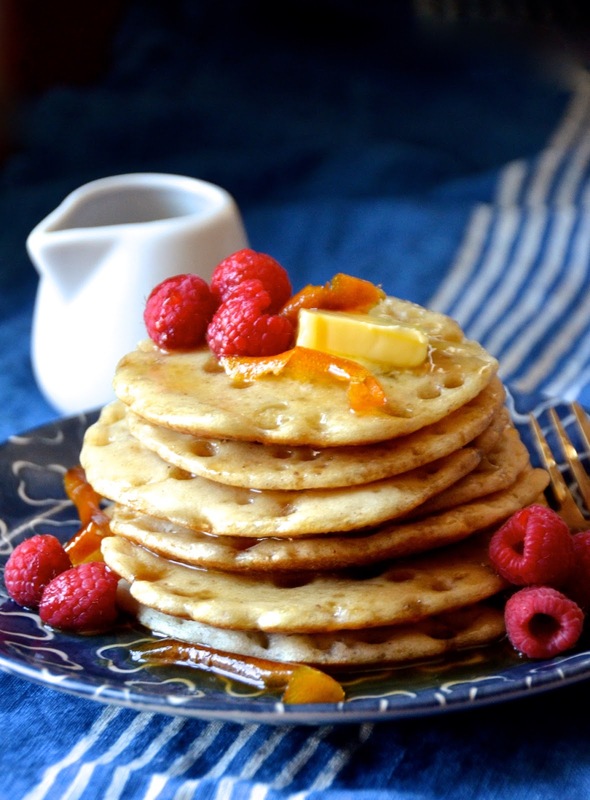 Let me know if you give these wonderful pancakes a try! Combine semolina, all-purpose flour, yeast, baking powder, salt, sugar, and warm water in a blender and puree until smooth and evenly combined (about 1 minute). Batter will be thin and pourable. Let batter sit at room temperature for 30 minutes. While the batter rests, make the syrup: Combine honey, water, orange zest, and orange blossom water in a small saucepan and bring to a boil. Reduce heat to low and let simmer uncovered for 5 minutes. Remove from heat and let cool. Make the pancakes: Heat a griddle or heavy skillet (such as cast-iron) over medium heat. Brush with vegetable oil. Working in batches, pour 1/4 to 1/3 cup batter per pancake, leaving 1-2 inches between each one. Let cook 3-5 minutes on one side, until the top develops bubbles and looks dry to the touch. Do not flip. Repeat with rest of batter. 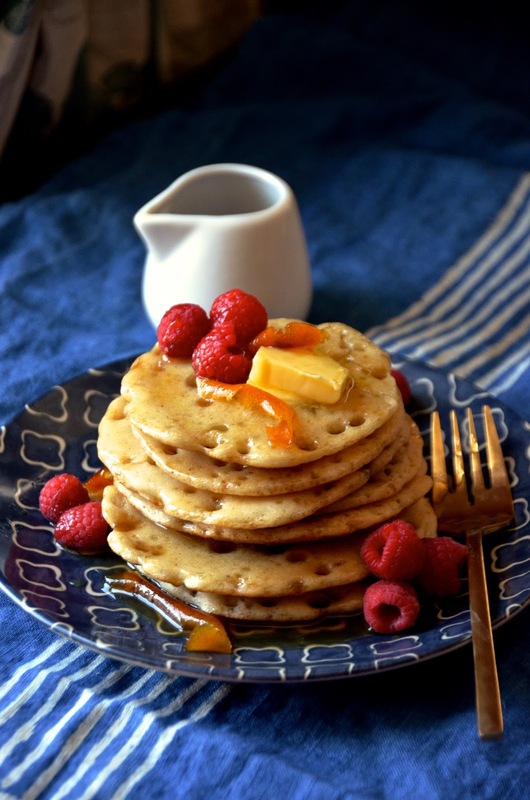 Serve pancakes stacked hole-side up, with honey syrup and pomegranate seeds or berries.